Manifesting becomes effortless when you have a clear intention that resonates in every cell of your body. This week allow yourself to remember why it is that you desire a soulmate. Consider how you, and your life, will be more enriched when you are sharing your daily life with your beloved. What is that you have to offer your soulmate? What is it that you most want to share with them? What is it that you most seek from the relationship? As you ponder these questions allow yourself to have an experience of present moment awareness where you can feel what it feels like to be sharing your life, right now, with your soulmate. Make this a daily practice. As you continue to focus your intention and attention on your heart’s desire, knowing that what you’ve asked for is ALREADY yours, you magnetize it to you. If you’d like more information on how to really understand and execute this mindset or would love more support around the concept of manifesting your heart’s desire, please listen in on this free recording. 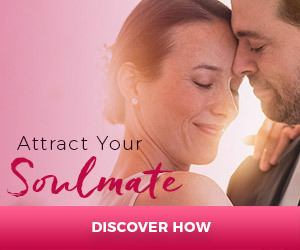 During this recording, I revealed the 3 KEYS to using the same simple, secret techniques I used to manifest my soulmate and husband Brian so that you can manifest YOUR true love. I will show you how to manifest true love and magnetize your soulmate into your life! If it is hard for you to FEEL your way into your future wedding, be sure to check out The Soul Mate Kit, you will find countless exercises to help you get over the obstacles and find your soulmate.